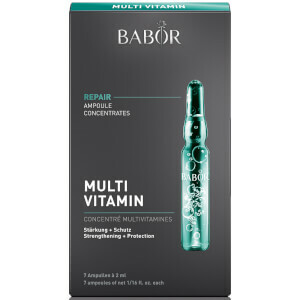 Revive dehydrated skin with an intensive moisture boost with the Hydra Plus Ampoules from Germany’s leading professional skincare label, BABOR; a set of seven individually sealed ampoules containing an advanced active concentrate to replenish moisture levels. Innovative and highly effective, each serum-based ampoule contains a complex balance of Hyaluronic Acid and a plant-based Polymer Moisturizer, which work in synergy to deliver essential hydration and lock in moisture with a protective film. Skin feels plump, fresh and instantly invigorated with a restored vitality. Aqua, Glycerin, Saccharide Isomerate, C12-15 Pareth-12, Sodium Pca, Phenoxyethanol, Peg-7 Glyceryl Cocoate, Parfum, Ethylhexylglycerin, Potassium Sorbate, Citric Acid, Sodium Hyaluronate, Sodium Citrate, Disodium Edta.